This tricolor narrowband image uses the Hubble palette where R= SII, G = H-a and B = OIII in order of decreasing wavelength. Astrodon 5nm H-a and SII and 3 nm OIII narrowband filters were used, along with Astrodon E-Series RGB filters. The system was off-axis guided with an Astrodon MonsterMOAG and SBIG ST-402 guide camera. The plate scale is 0.65"/pixel. The field is approx. 3/4 deg square and north is to the lower left. 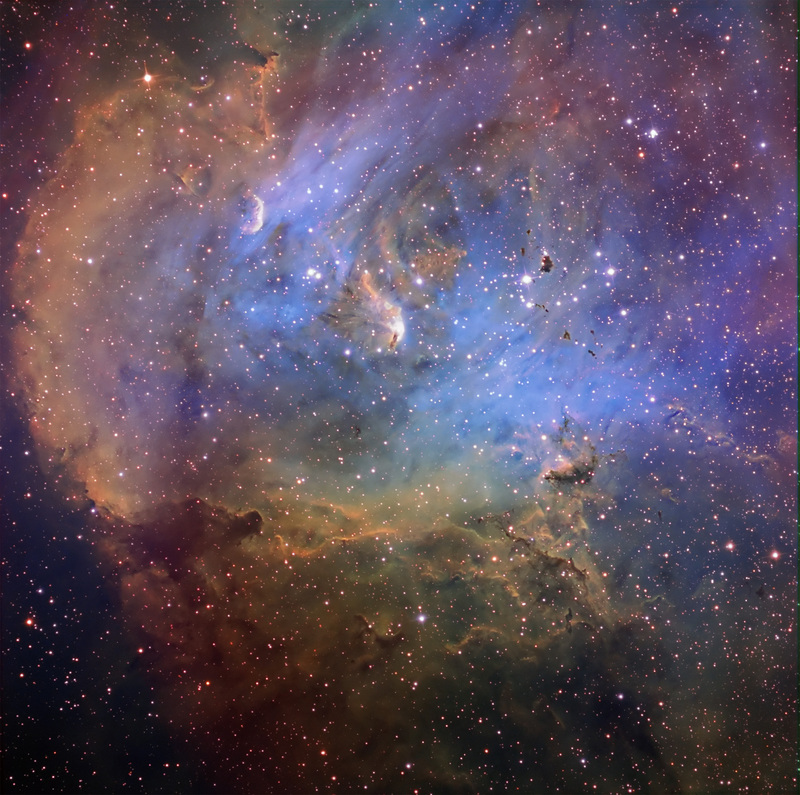 RGB was blended into both the narrowband background and stars. IC2944 in Centaurus is in the southern Milky Way, just west of the Southern Cross (Crux) about 5900 light years distant. It is catalogued as RCW 62* and Gum 42. It is also known as the "Running Chicken" Nebula, but the structure that this name was based upon is off the field in the upper right. The dark clouds are referred to as Thackeray’s Globules. The largest of these dark clouds was first discovered by South African astronomer A.D. Thackeray in 1950 and contains about 15 times the mass of our Sun. A close-up can be seen in an HST image from a 2002 Astronomy Picture of the Day (APOD). The RCW nebula catalog was put together in Australia by Alex Rogers, Colin Campbell and John Whiteoak at Mt. Stromlo under the direction of Bart Bok. It built upon and expands the 1955 nebula catalog of Colin Gum. Of the 182 RCW objects, 50 also have Sharpless designations.